Always clean mounting surfaces for pulleys to be installed. Pulleys should be a firm fit. Make sure harmonic balancer centering ring is free of rust, dings and paint. It is not unusual to use a small file on centering ring on original or re-used balancers. Generally, pulley alignment can be corrected by shimming pulley or bracket with brass shim stock. Pulley alignment within 1/16 inch on pulleys that are close is acceptable, and pulley alignment within 1/8 inch to 1/4 inch on pulleys that are far apart is acceptable. Power steering pulleys are different from A-engine to B/RB/Hemi engines applications. This also includes their mounting brackets 1970-Later. A-Engines can use BPE9016 or BPE9017 power steering pulleys along with the BPE9040 bracket spacer kit, either using factory power steering brackets or BPE9014. When changing from air conditioned to non-air conditoned pulleys or vice versa, alternator mounting brackets are different on both A-engines and B/RB/Hemi engines. Aftermarket performance dampers may cause pulley misalignment; refer to Pulley Fit Specification Pictures below. Chrome finishes require regular cleaning maintenance to resist chrome finish damage due to the elements. A-engine pulley will fit Magnum crate engines or Magnum engines using pre-1992 A-engine timing cover and pre-1992 A-engine aluminum water pump. Will not fit fuel-injected Magnum engines. Crankshaft pulleys will not work with original Street Hemi "Thick Production Style" Dampeners. 9016, 9016C, 9017 and 9017C are designed to work on B/RB/Hemi Eegines with Saginaw pumps only, but can be used on 1970 and later A-engines using our BPE9040 spacer and bolt kit. We do not manufacture any pulleys that will work on 1969 or Earlier A-engines with a cast iron water pump. 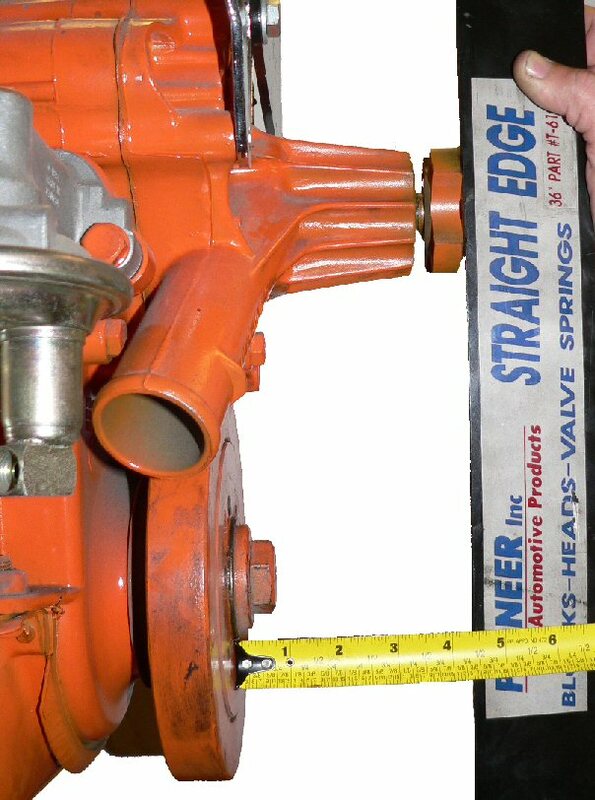 All Saginaw power steering pumps have pressure ports located on the rear, lower section of the pump. Federal Thompson pumps have the pressure port located in the front and on the driver’s side of the pump. You cannot mix or match factory air conditioning pulleys with non-air conditioning pulleys. Alternator mounting brackets are also different From Non-A/C to A/C Engines. BPE4014 or BPE4015 will not work with three groove or four groove crank pulleys. BPE4016 will not work with any other pulley but BPE4013 or four groove crank. When removing (or adding) air conditioning, you cannot just install pulleys, you must replace the crankshaft pulley, water pump pulley, and alternator mounting bracket. When using our BPE4016 double groove water pump pulley along with our BPE4013 four groove crankshaft pulley for B/RB/Hemi Crate Engines with air conditioning, you can elect to not use original water pump belt idler pulley and Bracket, and use only a three belt system (leaving outer crank pulley and outer water pump pulley groove vacant). All BPE pulleys and brackets are designed to work with standard style Chrysler alternators only. High amperage output versions of original style alternators are available from BPE, most having idle output of 55Amps at 1,000 RPM, and output of 90-95Amps at 2,500 RPM. BPE Reproduction Pulleys are stamped steel, just like the originals manufactured by Chrysler. As in all Stamped Steel Pulleys, including the originals by Chrysler, pulley concentricity (roundness) may vary 0.020 inch to 0.070 inch (up to approximately 1/16 inch). This does not affect the ability of the pulley to run true and retain its belt throughout the power band of the engine.